The Plain English tool checks the content of a document against a list of words, phrases, and formatting that have been defined as things to be avoided. The theoretical goal is to ensure that your documents are easy to read, understand, and act upon. To use the Plain English check you must first create a centralised list of things that you wish to avoid using. Each entry that you define can have associated with it a list of preferred alternatives to be used as straight replacement text and/or a set of instructions about what to consider if manually changing the wording. 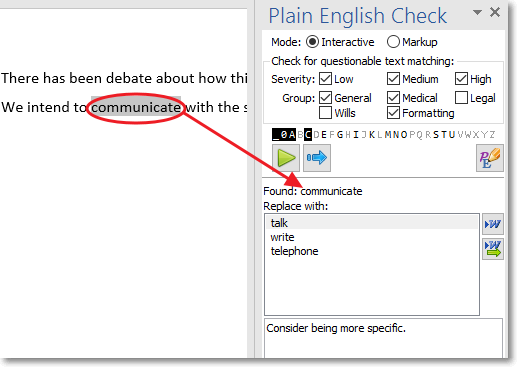 The example shown above has found the word communicate and is suggesting that it be replaced with talk, write, or telephone (or a variation of them). The “Consider being more specific” text in the box at the bottom right represents a free-format extended description that you can add to each entry – it might direct you to your corporate Style Guide or, in the case of an identified formatting problem, it might explain which Word ribbon buttons to use to fix the situation. number ranges are like “12–18” not “12 – 18” and that the separator is an en dash not a hyphen.